This is horrendous. This is the IMDb page for a film…something which has, in the past, always given the reader an encyclopedic view of a movie. Now you have to scroll down to see any useful information and even then it is not easy to discern the actual content from the overwhelming amount of advertising material. What happens if I mask out everything which isn't actually IMDb info about the film? At what point should we become concerned by Amazon influencing the IMDb ratings of movies that they would rather see portrayed in a more positive light in order to sell content from Amazon.com? 1) Start playing a video in Safari. 2) Switch to the home screen or to another app. You will notice that that the video stops. 3) Pull up the Control Center interface from the bottom of your iOS screen, and click the play button in the music/video player controls section. That's all! I have found that this technique also works in the Vimeo app but not in the YouTube app (even though you can still see the video player controls in Control Center). I wonder if this means that app developers can enable such functionality. The story exposes how it might not always matter if you use ultra secure passwords, because the sometimes the weak point in any system is the human element. After reading this worrying account, I was moved to contact my own domain registrar (Hover) to find out if the same thing could happen to users of their service. I’m sure you have heard the story today about the twitter user (@n) who had his name hijacked, partly through weak security by GoDaddy. As someone who also relies on a personal email address tied to my domain name (managed by you), this made me wonder about how likely this risk was with other domain registrars. Can you vouch for the security of your system, and that your phone support staff wouldn’t accidentally divulge important information to someone posing as myself? It has been our policy that the phone staff does not give out personal information listed on a Hover account. We also will not make any updates to that account without direct consent after confirming the identity of the person making the request. We're aware of the story that came out today, and although two-factor authentication has been in development (along with many other new features) it's priority has certainly been escalated. I have linked an article below that we posted a few hours ago on our blog to address any concerns that people may have about account security at Hover in light of this incident. If you have any further questions, please feel free to contact me again or you can post them in the comments section of that post as well if you'd like. What a great response. I'd recommend reading their blog post for more information. Also, I would generally recommend Hover to anyone looking to register a domain name (and not just because they have a great sale on at the moment). They make it fast and easy to get a domain name, and they don't pester you with emails. If you were thinking of using them, please consider using this referral link which would credit me with a couple of bucks. Senator Al Franken has written to Apple CEO Tim Cook to ask many questions about the security of the new 'Touch ID' fingerprint sensor in the new iPhone 5S. I can only assume he's asked the exact same twelve questions to Dell, HP, and all of the other manufacturers of fingerprint scanning technology. I've recently started using a price-tracking service called The Traktor. A simple browser extension allows you to track the price changes of products on Amazon, and optionally be alerted when a product drops below a target price. 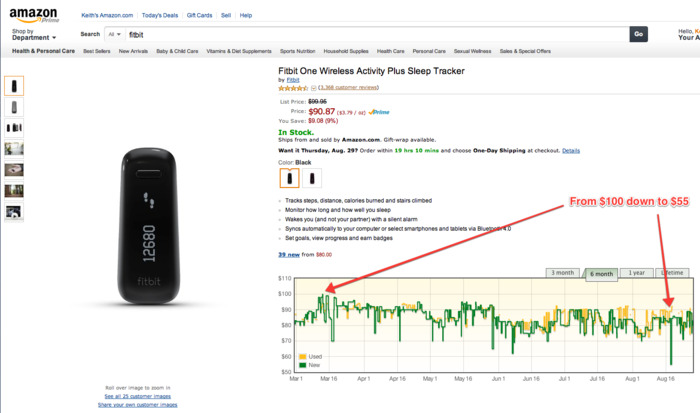 The tool also embeds price history graphs on the Amazon pages of each product. It's a little bit crazy when you start noticing just how often Amazon changes price. It's not just by the day, it can vary by the hour. For example, consider price changes over the last six months for the Fitbit One activity tracker where the price is almost halved, albeit for a few hours (click image to enlarge). I guess it can pay to watch those prices closely (as long as you are prepared to wait). 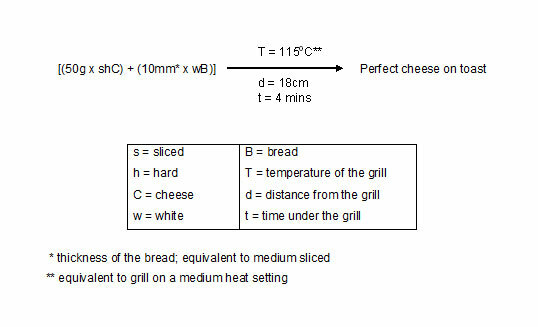 The work, conducted in association with the British Cheese Board, concluded that sliced cheese, grilled further away from the heat source, and grilled for about four minutes gave the best results. A 49-year-old man was arrested in Deltona late Tuesday on suspicion of stabbing his brother in a fight that started over some missing macaroni and cheese and spilled beer. According to the Volusia County Sheriff's Office, a witness said Zipperer was at his home on Danforth Avenue when he became upset because he couldn't find his mac and cheese. He must really like mac and cheese. Earlier today I was taken to task on twitter by Jason Snell for my, admittedly harsh, review of a pilot episode of a potential new podcast for TechHive. He later mentioned to me on twitter that they (TechHive) are "seeking something that's not like every other tech podcast". As a conciliatory gesture, I thought that I would try to come up with some (serious) ideas for five new tech-related podcasts that I might want to listen to. These are ideas that aren't really the sole focus of any current podcast (maybe I'm wrong and someone is already doing these sort of shows, please let me know if this is the case). The host invites a guest to talk about what their fantasy Apple hardware product would look like. Would it be a 12-bay Mac Pro with 16 PCI Express slots to suit the tastes of someone like John Siracusa, or maybe it would be an all-wireless iPod (inductive charging plus bluetooth headphones). The guests discuss how far away from reality this hypothetical product is, who would buy it, and how much it would cost if it could be made. Take a trip down memory lane as the host and his/her very special guest rewind time to talk about how the introduction of a past Apple product changed their lives or set them on their way to a life of Apple fandom. Maybe it was their first ever Mac computer (a 2001 dual-USB iBook if you're interested), or their first ever iPod (for me, the much maligned 3G iPod), or maybe it was discovering the wonders of Apple's iTools service. A shameless rip-off (it wouldn't be the first) of an occasional feature from BBC's Top Gear show. Every week the host of this video podcast attempts to destroy a perfectly fine piece of Apple hardware in an reckless, but highly unorthodox, fashion. Ever wanted to see someone steamroller a Mac Pro or see what happens when you put an iPod nano in the toaster? Now's your chance. Another shameless rip-off, this time of the much loved BBC radio show Desert Island Discs. Each week a new 'castaway' reveals to the host what Apple products they would buy if stranded on a desert island (which luckily has 4 working power outlets and 1 working Ethernet port). Luckily, the castaway has a $2,000 Apple store gift card to spend (we assume that Apple will deliver to this particular desert island and will waive the delivery charge). The guest explains what they would buy and why, though the $2,000 must cover all cables, accessories, and software. Choose wisely! Each week, the host takes a current technology related story that is making the headlines and explores the issue in depth, going back to look at where this story arose and what longer-term significance might arise from the news. The story behind the story might focus on a single product revealed at an Apple event, the appointment of a new CEO at a major tech company, or even the relaunch/rebranding of a Social Media web site. I listen to a lot of technology-related podcasts, especially those that discuss Apple products and the wider apple ecosystem. So it was a shoe-in that I would give a new podcast from TechHive a listen. The new podcast is called 'Clockwise' and was announced on twitter by its co-hosts Jason Snell and Dan Moren. You can listen to the podcast here. This particular episode is the pilot and subsequent tweets by @jsnell suggest that the podcast might evolve in response to feedback. I really hope so, because I find the format of this show to be awkward. Painfully awkward. Tech-related podcasts often take the format of either having two seasoned co-hosts (e.g. Mac Power Users), a main host and a guest host (e.g. The Talk Show), or a rotating cast of panelists with one main host controlling events (e.g. The Macworld Podcast). Clockwise fits into the latter category and if you were expecting it to feature intelligent, but sometimes humorous, discussion of current technology news, then you'd be right. So this all sounds good right? Not quite. I say this because Clockwise tries framing the podcast with a game show-esque mechanism that is as clumsy as it is unnecessary. Rather than just having two erudite guests (Phillip Michaels and John Phillips) join the two co-hosts for 30–40 minutes of intelligent, round-table discussion, the show has been straight-jacketed with various rules that become increasingly bizarre. These rules start with the requirements that a) each panelist introduces one discussion topic in turn and b) panelists discuss each topic but get a sum total of seven minutes to use across all four topic discussions. Should any participant exceed his or her seven minutes or talk time, they will then have to — and you might want to sit down at this point — remain silent! The discussion proceeds clockwise, but the participants also need to keep an eye on the time, so they also need to be clock-wise. Geddit? This gripping format had me on the edge of my seat (though admittedly this was because there was a sleeping cat sharing the sofa with me). The podcast doesn't quite go so far as to add a ticking clock sound effect to add tension, though they do ring a bell when a participant finishes their discussion in each round. Otherwise, how would we know when someone else starts speaking? While listening to the podcast, I was initially unsure whether these timing rules were just a private joke, but then Jason Snell explained the grim fate that would befall each participant who ran under their seven minute limit. They would have to — and again, you really might want to sit down before you read what follows — speak on a subject of their choosing to use up their remaining time! This 'Extra time' round is almost exactly like the tense finale at the end of Star Wars as Luke Skywalker races against time to destroy the Death Star and save the Rebel Alliance...except that it isn't. I'm not sure whether these rules are meant to make us excited and/or nervous for the participants as we listen along ("Will they overrun? ", "Are they sweating under the horological-induced pressure? ", "Can Jason Snell really cope with having to speak for 1 minute 32 seconds on a subject of his own choosing?"). It feels at times that Clockwise is trying to be both an intelligent tech podcast and comedy game show all at once. However, in my opinion it ends up achieving neither. At least the show gives us the thrilling 'Extra time' segment to look forward to. After 30 minutes or so of some relatively informed discussion, what topics would the panelists choose to speak about with their remaining time? One participant used this time to enrich our lives by revealing that he's recently been watching 'So You Think You Can Dance'. After the 'Extra time' section, the show concluded with another segment which had some sort of theme but at this point I had lost the will to live and so my memory of this part is somewhat hazy. At an early point in this pilot episode, Jason Snell reveals that "We don't want to waste your time". Too late me thinks. In my next post I'll be discussing my new panel-show podcast called 'McMacMac', a podcast where guests discuss the latest news from Apple, but must use a Scottish accent when naming any Apple hardware product. Failure to do so means the contestants must immediately eat a Big Mac. He subsequently tweeted a link to the "official Twitter account of TechHive's Clockwise podcast"
Later asked whether he would be proceeding with the podcast, he may or may not have said "No we're not going to f***ing do Stonehenge"
The NASDAQ index is included for comparison, though obviously the growth in the NASDAQ is partly due to the growth of some of these companies. Google is excluded because there’s not quite a decade of data yet, but — if you’re curious — their share price has grown 670% over ~8.5 years. Dell's share price has actually fallen (-53%), so it is hardly surprising that Michael Dell wants to buy back the company. 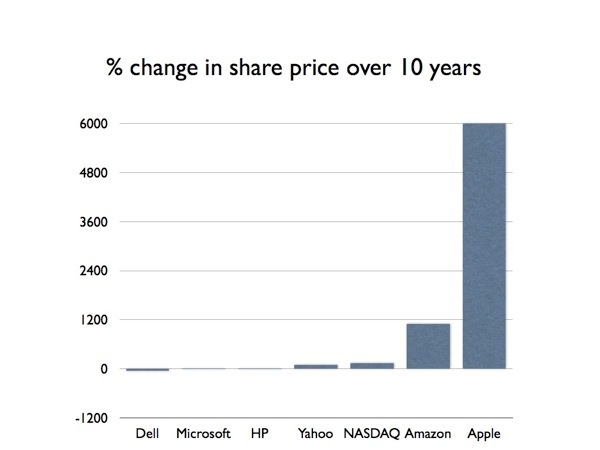 Microsoft and HP barely register on the chart, both with single-digit growth. There may be a problem with my calculations though because I was led to believe that Apple was doomed. I was browsing my February 2013 copy of Macworld magazine when I spied an advert for ‘mophie juice pack helium’, a new battery case for the iPhone 5. The helium name was reinforced by the ‘lighter than air’ strap line. Intrigued, I immediately headed to Mophie’s web site and searched for helium. No joy. I then went to the iPhone 5 products page expecting to see the helium case listed. Again, no joy. The page did have a sign-up box where you could be notified when their ‘new juice pack cases are ready’. No mention of the ‘helium’ brand though. Strange. Intrigued by this. I turned to Google. Very strange results. 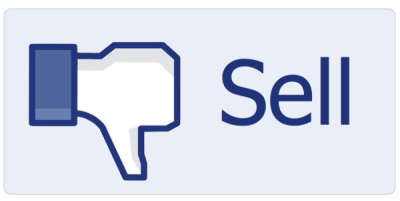 The top hit was a page about their trade mark for the name (as was the 4th hit). The 2nd and 4th hits were for sites that claim to sell the product but which listed it as out of stock or as discontinued. I can understand that you can start marketing a product before it is available to buy — or sometimes before it even exists — but this seems a really strange situation. A print advertisement exists in a top-tier, iPhone-related publication, but barely a mention of the product name anywhere else. What are mophie up to? You want your cheese to come sandwiched between layers of yet more cheese? How about 12 layers, featuring six different cheeses (and bacon, because you need bacon, right?). Maybe if scientists hadn't been so busy trying to do pointless things like put a man on the moon, we wouldn't have had to wait until 2012 before someone invented a 5 lb cheese ball. As Facebook took to the stock market last Friday, their share price initially rose as high as $42.05, but ended up the day essentially flat at $38.23 (and only because underwriters intervened to somewhat artificially prop up the price). How many more big cats are there which Apple can use for naming their future OS X releases? Well not that many. Mountain Lion is now the confirmed name for 10.8 — quashing the rumors that Apple execs were favoring the name 'Ocelot' — but does 10.8 mark the end of the line of a cat-based nomenclature for Mac OS X? As WWDC, Apple's annual developer conference, draws ever nearer, the tech-world is in a state of fever pitch as pundits try to guess — and sometimes second- or triple-guess — what new or updated products will be soon be released by the Cupertino-based technology giant. Fact 1: Apple may or may not release a new version of their groundbreaking iPhone "at some point" in the "near future". Such a phone, if released, may - or may not - be thinner, lighter, and/or more powerful. It almost certainly might contain several new features, some of which may excite and/or underwhelm technology journalists. The screen size of the prospective new iPhone might conceivably be larger than on the current iPhone, unless it isn't. Fact 2: It's beyond a shadow of a doubt that Apple's iCloud service will receive a significant revamp, unless Apple chooses not to. Such iCloud-based services, if they exist, will probably be deployed over the coming weeks, months, or years unless Apple decides otherwise. Fact 3: It is almost incontrovertible that within 12 months, Apple's entire product line may look "somewhat different" to their current product line up. Consumers should expect that there is a very high probability that Apple Stores may in future be stocking several new products, particularly if they actually make and release these new products. Fact 4: Apple may well decide to discontinue the MacPro, in which case it is almost certain that consumers will no longer be able to buy a MacPro. However, if Apple decides to continue the MacPro then we can exclusively reveal that consumers will still be able to buy the MacPro. Possible revamps for the MacPro line include making it smaller, making it bigger, keeping it exactly the same size, or replacing it with a pony (USB 3.0 compatible). Fact 5: The product to receive the biggest transformation could potentially be the venerable iPod Classic which, if updated, might gain several new features such as a 23" AMOLED display and a stylus. An even bigger transformation might be to abandon the product altogether, or revamp it into a new form factor that includes a phone and touch screen. Continued ad nauseum by technology journalists everywhere. A Cookeville man has been banned from a local grocery store after he ran from from the store with two blocks of cheese in his pants that he did not pay for. From the Cookville Herald Citizen. Are you missing some Markdown? Maybe Simplenote is to blame. I write a lot of short text notes, and for many years I have been storing these notes in the fantastically useful nvALT application on my Mac (this is a fork of the almost-as-useful Notational Velocity application). Making this tool even more useful is the fact that nvALT can sync all of the notes with the Simplenote service. This makes it easy to have your notes accessible from the web, or from a wide range of iOS, Android, and desktop clients. Recently, I made a change to how I worked with my notes. Rather than storing the notes in a single database file, I used the option in nvALT to instead store each note as a separate text file. This means that you can store all of your notes in Dropbox which in turn means that they can then be accessed by even more apps (especially on the iOS platform, Notesy and Byword being my two favorites at the moment). An important point to note — no pun intended — is that you can still sync notes via Simplenote in addition to syncing via Dropbox. My pluses had been converted to space characters. At first, I thought this may be an issue with the new iOS note editor I was using (Notesy), but this is happening even when Notesy is not running on any iOS app. It turns out that the culprit was Simplenote. It's possible that it was due to the combination of syncing nvALT with both Dropbox and Simplenote, though I suspect that Simplenote alone was the culprit. Turning off the Simplenote syncing fixed the problem, and I guess this experience means that I will be sticking with Dropbox syncing in future.